Southside's Music and Performing Arts studio offers a variety of music and recording studios. Learn more about each studio below or contact the Work of Art Department for more information. Southcast Internet Radio is our participant-run online radio show, featuring interviews, reviews, stories, poetry, and other informative and people-centered segments. Podcast episodes are recorded and produced at our CLARA Studio location in Midtown, and released on our website and Soundcloud page each month. Open music studio offers the opportunity for individuals to learn the fundamentals of voice or various instruments. 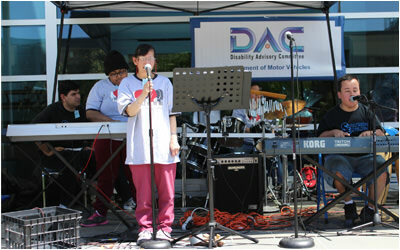 They may also make musical connections with other participants through drum circles, open jams, and other group activities. Southside currently offers instrumental instruction in guitar, piano, flute, recorder, voice (pop, folk, and classical styles), ukulele, and percussion. We have an array of instruments available for in-studio use including a full drum kit, assorted percussion, acoustic and electric guitars, autoharps, keyboards, an electric bass, and an upright piano. Open music Studio also offers participants an opportunity to learn about historical and contemporary music and music genres from around the world! The Early Birds, our performing rock band, was originally formed in 1986 under the name The Southside Ensemble as a percussion ensemble. At this time, the band was lead by a music therapist to teach rhythm fundamentals and encourage cohesion among participants. Later the group would evolve into accepting various instruments into the fold as more musical talent came to Southside, eventually including a rap element, and later singing. In 2008 the studio was dedicated to former band member Michael LoBuglio. By this time the band had become a full-fledged rock ensemble and was writing their own original material, recording albums, and traveling to perform on a regular basis. The band continues to grow along with the artists as they influence its direction. Along with their own original songs, they've performed hundreds of covers, showtunes, classic rock, and re-imagined versions of popular music. In October 2017, when Southside Art Center transitioned to Southside Unlimited, the Southside Ensemble rebranded themselves as The Early Birds. The Early Birds represents the very best of what we accomplish at Southside Unlimited, with high standards of excellence in professionalism and musical quality. Follow The Early Birds on Facebook!! Jemel started with the band 15 years ago when it was still the Southside Ensemble. She plays bass on the keyboard and also does keyboard leads, and backup vocals. She likes to play all kinds of songs from golden oldies to today’s artists. When she’s not playing in the band, she produces segments for Southcast Radio, our onsite podcast. Pam is the drummer and backup vocalist in The Early Birds. She is inspired by many types of music, but one of her favorite drummers of all time is Ryan Sullivan from Survivor. When Pam is not drumming you can find her working in the recycling center at Southside! Joe has been a singer in the band since 2014. The kinds of songs he likes to sing best are vocal pop ballads like Love Me Like You Do by Ellie Goulding! He enjoys listening to groups from the 80s, 90, and 2000s, especially Destiny’s Child, Dream, and The Spice Girls. When Joe is not singing in the band, he attends Beginning Music, and writes articles and posts for the Southside Blog. Matthew Meno is lead keyboardist in The Early Birds. Along with keyboard, he plays organ, harmonica, drums, and sings. Matthew is most inspired by musicians from the 50s, 60s, 70s, and 80s, including Elvis and Roy Orbison. He has been in the band for 3 years. Thanh is a singer in The Early Birds. She enjoys all kinds of music; currently she is learning Brown Eyed Girl, which is one of her favorites. She likes to sing a range of styles including rock, pop, oldies, and folk.